The 4-H Poetry Contest is being held again this year. The contest is open to all LaRue County youth, ages 9 to 18. Each youth may enter one poem for the competition. All poems must be submitted to the Extension office by Feb. 20. Most students have probably already written poems for school. Why not turn your best poem in to be judged? Teachers, you may even wish to require your students to participate in the poetry contest, or give extra credit for those students who participate. It’s easy for us to think of this year’s tax refund as free money coming to us courtesy of Uncle Sam. However, the truth of the matter is that the check you receive is a return of your own hard earned money. And since you’re going to get your own money back, why not use it to get ahead of your financial goals? The Circuit Court Clerks of Kentucky made 2014 a momentous year in the fight to save lives. With 998 Kentuckians on the waiting list for an organ transplant, there is no better time to join the Kentucky Organ Donor Registry. In 2014, 103 individuals in Kentucky were able to save 332 lives, and many more individuals enhanced someone’s life or gave sight through tissue and cornea donation. More than 124,000 patients are currently waiting for their organ transplant. Each day 21 patients lose their fight, and their lives, waiting. 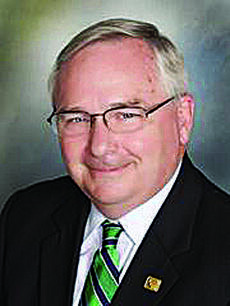 Jim Long is returning to Citizens Union Bank in Elizabethtown as market president for CUB’s central Kentucky market. He will lead commercial, business banking and consumer lending efforts, according to a news release from CUB’s board of directors in Shelbyville. Long will continue to serve as senior Vice President of Special Assets for the Bank as well. LaRue County Schools are on one-hour delay Tuesday due to the weather. It’s an often-used cliché in sports about being in the right place at the right time. When it comes to Tony Hatmaker, that wasn’t just a line, but an opportunity to return to the place where he starred as a player. Hatmaker was named the LaRue County football coach Thursday, returning to his roots. Hatmaker, who played football and baseball for the Hawks, replaces Josh Jaggers, who resigned in December. Local police and the FBI are on the lookout for two men with ties to a kidnapping in Missouri who were last seen near Bardstown. Police announced that they’re looking for the suspects, who are considered armed and dangerous, after a stolen van involved in the abduction was found wrecked on the Bluegrass Parkway Thursday. At press time, both suspects were still at large and authorities say it’s unknown if the suspects are still in Kentucky. Due to the bad road conditions tonight's homecoming game is being canceled and will be rescheduled for a later date. Sen. Wendell Ford died Thursday at his home in Owensboro after fighting lung cancer. He was 90. Gov. Beshear also directed that flags at all state office buildings be lowered to half-staff from sunrise Friday, Jan. 23 through sundown Tuesday, Jan. 27, 2015. The public is invited to visit the Capitol on Sunday, where Sen. Ford will lie in state from 11 a.m. until 6 p.m. A memorial service is scheduled for 3 p.m. Gov. Beshear and Lt. Gov. Crit Luallen will participate in the service.